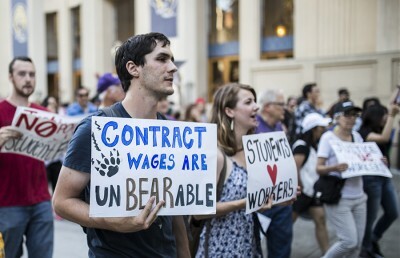 The California Nurses Association, or CNA — a statewide nurse union — hosted rallies across the state last Thursday to push for improved pay and patient care as nurses employed by the University of California continued to negotiate their contracts. The nurses held events ranging from informational pickets to candlelight vigils at at least nine locations across the state to provide information and spread awareness about their contract demands. According to Michelle Kay, a nurse practitioner at the Tang Center and California Nurses Association nurse representative, UC nurses have worked without a contract since October and have been in negotiations with the university for more than eight months. 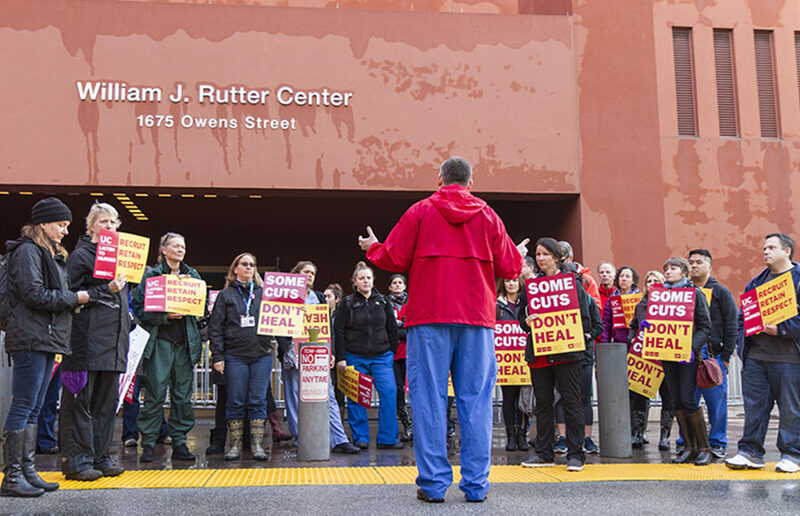 The CNA, which represents 14,000 registered nurses at five UC medical centers, 10 student health centers and the Lawrence Berkeley National Laboratory, planned the rallies to coincide with last Thursday’s UC Regents meeting at UCSF. At UC Berkeley, nurses and their labor representatives greeted Tang Center employees with stickers and information about their contract negotiations. Nurses wore red clothes and pins that read “UC nurses, 14,000 strong” — referring to the number of nurses in their bargaining unit. Kay explained how low wages, inadequate retirement plans and Berkeley’s high cost of living put excessive burdens on nurses at the Tang Center. Kay also said nurses want more opportunities to continue their education and training. In a statement, the UC Office of the President said their current contract offering includes market-competitive wages, quality patient care and excellent retirement benefits. 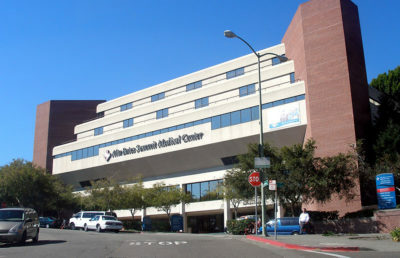 The current contract reduces amount of time that superiors have to notify nurses of scheduling changes from two weeks to two days and increases the age at which nurses receive full pension from 60 to 65, according to Shirley Toy, a UC Davis Medical Center nurse and a member of the contract bargaining team. She added that the UC’s proposal also ignores many of the nurse’s demands and compromises nurse’s ability to provide quality care. “UC hasn’t agreed to any of our staffing or our patient-care issues, and then they want to take back a lot of gains that we have earned in the past that help with work-life balance and workers’ rights,” Toy said.